Be your own guru, your own teacher. You have the lamp within you. Light it and march on without fear. Not everything that is faced can be changed but nothing can be changed until it is faced. We are not born all at once but by bits, the body first and the spirit later. Our mothers are racked with the pain of our physical birth; we ourselves suffer the longer pains of our spiritual growth. Losing an illusion makes you wiser than finding the truth. There are seasons, in human affairs, when new depths seem to be broken up in the soul, when new wants are unfolded in multitudes, and a new and undefined good is thirsted for. There are periods when to dare, is the highest wisdom. Everything will change when you desire to move on exceeds your desire to hold on. All adversity is really an opportunity for our souls to grow. The place where you are right now Spirit circled on a map for you. The process of learning anew is more the process of unlearning that which is not true. Kennedy Fear is what prevents the flowering of the mind. A fear named is a fear tamed. To grow beyond the expectations we're raised with is a radical act necessary to the claiming of one's full self. Looking for the Key I looked within myself to find the answers Because I knew although I can't say how, That deep inside me the truth awaited me So, fearlessly, I opened the door to eternity, And walked in. True teachers connect us to rivers. They connect us to a flow of information and experience that was there before the teacher and will be there after us. Anyone who sets out on a journey of self-development will be aided. There will be guides and teachers who will appear, and spiritual protectors to watch over the traveler. No test will be given that the traveler does not already have the strength to meet. Truth only reveals itself when one gives up all pre-conceived ideas. I am. These are two of the most powerful words in the universe because what you put behind them defines you. The only thing we can take with us out of this lifetime is the knowledge and wisdom that our soul acquires. So any gain we make in knowing ourselves will stay with us. 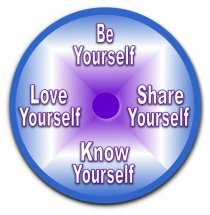 Can you answer this series of questions associated with self-knowledge? 1. Know Yourself: Discover who you are. Learn all you can about yourself. Trawl your subconscious for hidden memories. Heal past pain and trauma. 2. Love Yourself: Believe in who you are. Know you deserve the best. 3. Be Yourself: Empower who you are. Be authentic by extracting others’ voices and influences. 4. Share Yourself: Discover your inner prizes. Share your gifts with the Universe. Each one of us is a prize from the Universe to our Self and from our Self to the Universe. Each one of us has a unique gift to give. Your personal prize is as precious as diamonds, more valuable than gold, and the most beautiful rainbow ever seen. 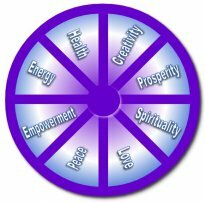 Soul School is called Your Wheel to Fortune because once we heal old wounds, cancel outdated vows and contracts, and create a luminous energy body, we are free to find our treasure chest. You may be seeking that treasure chest full of Peace, Empowerment, Energy, Health, Creativity, Prosperity, Spirituality, or Love. But I guarantee that by the end of the Soul School series, you will find that you are the treasure in the chest! Many of us are familiar with the principles of The Secret. We have tried to manifest our heart’s desires with affirmations and positive thinking. And many of us have become frustrated and discouraged when what we thought we wanted did not materialize. There may be blocks to the flow of manifesting such as: past contracts and vows you’ve made, pre-life selection scenarios you have chosen, past defeats that have left you feeling that you are not good enough and or deserving. Perhaps receiving something we think we want isn’t in our Highest Good. In Soul School, you will learn that you are The Secret. And that by doing your personal work you are transforming into the energy that will attract the life you desire. Sometimes the thought of facing our fears immobilizes us to the point that we feel blocked or stuck. But it is the fear of the unknown that is the most debilitating. The biggest step in facing our fears is identifying them in our conscious mind. Then the charge begins to dissipate and we are activated to vanquish them altogether. Like a caterpillar that needs incubation time to fly like a butterfly, we all need rest and rejuvenation between intense growth periods. So if you’re feeling stuck or blocked, consider that you are in a dormant period waiting for the next spurt of growth. This dormant period will shift when the timing is perfect for you. Just because you aren’t moving, it doesn’t mean you are stuck. Just because you’re not moving forward, it doesn’t mean you are moving backward. Trust that you are always exactly where you are supposed to be at any given moment in time. You may simply be on a resting plateau, that place of rejuvenation where you need to prepare for your next zoom period. But if you are reading this article, it may be a sign that you are ready for a transformation. And if you are ready for a growth spurt, I invite you to give Soul School a try. In Soul School we explore the hidden clues to ourselves that have been buried in our childhood, in our lives in the womb, and in our past lives. Because the key to wisdom and higher vibration is knowing yourself, the Universe (including your angels, spirit guides, ancestors, and Higher Self) will support you on our journey as you fulfill your life purpose. All distress and dis-ease has a core cause which requires a multidimensional process to identify and clear it. Soul School provides the tools and support for this process. Layers of unhappiness and frustration can be peeled away to discover a core of joy and self-empowerment. Soul School offers a holistic “soup to nuts” approach for healing body, mind, heart, and spirit, with the goal of fully integrating the physical body with the energetic body in the present life, past lives, and between lives. Soul School supports major personal transformations and energetic shifts as well as teaches healing techniques that can be used on family, friends, and clients. 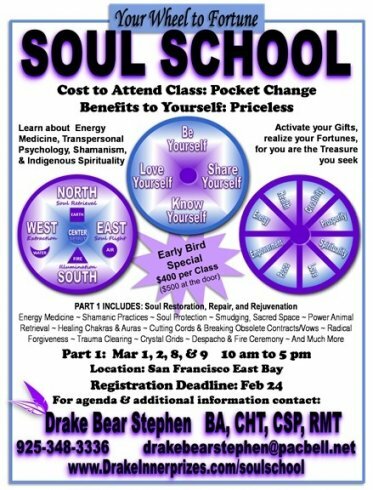 Soul School is a combination of wisdom from Energy Medicine, Transpersonal Psychology, Shamanism, Indigenous Spirituality, Ceremonial Crafts, Ritual, and Metaphysical Principles. The participants become a community of like-minded souls and mentor each other through experiential exercises. Also included in each part of the curriculum is: making spirit crafts, receiving energetic rites, and creating a medicine bundle. Participants receive comprehensive handouts and homework assignments. 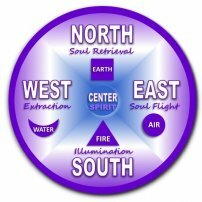 Participants that complete all 4 parts will receive a Certificate of Completion for 90 hours of Soul Work in Shamanic Energy Medicine.